Creating works of the heart. Good morning everyone! Time once again for another super fun challenge from the Create with Connie and Mary team! This week we are being challenged with color! Take a look at these most beautiful colors! 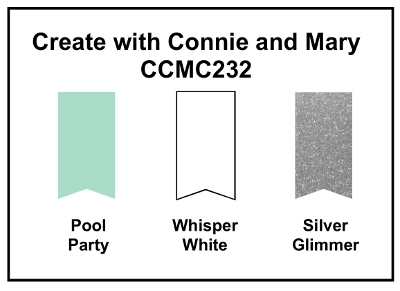 Pool Party, Whisper White and Silver glimmer. Oooohh!! Aren't they so pretty!! I wasn't sure what I wanted to do but I knew I wanted to use some new toys!! So I turned to Valentine's Day. Take a look! So I started with a piece of Whisper White and ran it through the Big Shot with the Perfect Polka Dots embossing folder. Then I added a strip of silver glimmer paper that was punched with the scallop edge border punch and a piece of Pool Party designer paper. I rounded the corners with the corner rounder and tied a piece of Pool Party ruffled ribbon around this before popping it up onto a card base of Whisper White. Then I stamped the lacy heart from Hearts a Flutter in black StazOn onto Pool Party. I used the coordinating framelits dies to cut it out. Then I popped it up onto the card. I stamped the greeting from Teeny Tiny wishes in Pool Party onto a strip of Whisper White and flagged one end. The other end is tucked behind a heart that was punched from silver glimmer paper using the small heart punch (which is also popped up onto the card). Be sure to see what the other designers did with this color scheme by visiting the Create with Connie and Mary site. I hope you will be inspired to play along with us this week! We always love to see what you do! Thanks for stopping by and have a super day! Love this layout Deb. The silver border and heart are just gorgeous. This is an especially pretty card layout and I love the combo of Pool Party with the small touches of silver glimmer paper. Great combination of raised dots and flat dots on the DSP. Looks great paired together along with the heart on heart. So adorable! Happy New Year! Darling non-traditional Valentine card! So cute! Super cute! 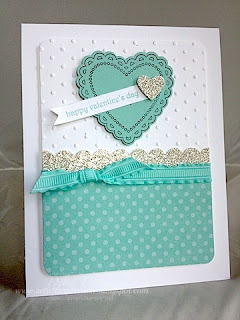 I love these colors for a Valentine's card, along with the details - polka dots and silver glimmer, scallops, etc. I am a wife to a wonderful, hard-working husband of 20 years, a mom to a very energetic boy and a Stampin' Up! demonstrator. I love to spend time with my family watching baseball games, camping, 4-wheeling as well as winter activities like skiing and snowmobiling.